I want to thank everyone for voting yesterday. I know that not everyone got the outcome they wanted, but voting is democracy at its best and I am glad everyone was given a chance to cast their vote. I have had four hours of sleep, so I am not going to try and post anything that requires any intelligent thinking. Instead, I am going to post some simple findings on this very rainy and cold fall day. The little stacked stools make me smile...and the plant in the morning sunshine is beautiful. Stay warm and get back under the covers! These photos inspire me. I am tired as well. My electricity went out about 10 p.m. Don't know why. Great, I thought. No more results on CNN! I fell asleep and the TV came back on just as Obama took the stage. What timing. these photos are so inspiring! i love the shabby crates and foot stools all together. i hope your day brightens up!! Wow Laura, you did all that without thinking? You ARE amazing! lol. great work. Beautiful findings! 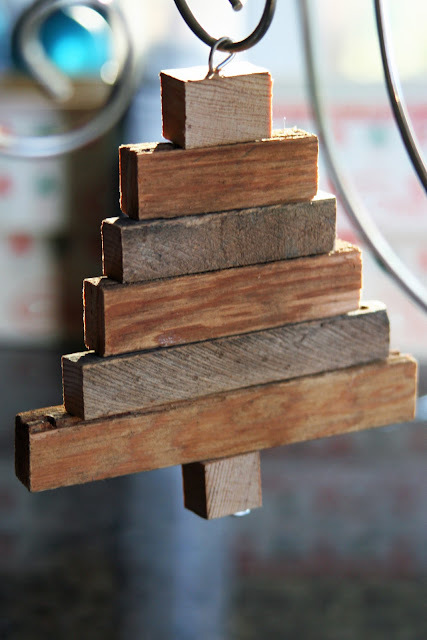 Love the rustic stacked-wood tree. How beautiful, Laura! I already pinned the cabinet with the screen door from your Pinterest page. No wonder it looked familiarly appealing! The stools stacked on the chippy box are beautiful and I also loved the lily of the valley in the little crate. No rain here today, but overcast and chilly. Beautiful. That you for sharing these with us. I like the simple tree ornament in the first picture. Simple but rustically elegant. Also simple and elegant was your gracious comment on the great privilege and civic duty to cast our votes. Very positive and uplifting. Thank you. Nice images! I'm tired today too. Houseguests, time change, crazy election all in the same week! I need to catch up on some sleep! I needed some simple beautiful this morning! Thank you. Lovely. Does it say something about me that I kept seeing Christmas possibilities on those already? Really nice presentation, Laura. Rustic always lures me to linger and enjoy the simplicity of it’s design. I’ve come back to this page three times for the pleasure of viewing these pieces once again. Pretty photos of lovely items. :) How is your new business doing?